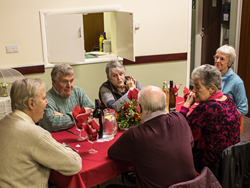 Beckingham and Saundby Village History Group Annual Social 2016 was also a 10th Anniversary celebration for members and special guests, held in the Recreation Room on Thursday 27th January. A few words of gratitude were said, firstly by Chris du Feu who thanked the Chair Freda Proudley, on behalf of the group, for all her hard work, organising, planning and keeping everyone in order. Freda then thanked everyone for their support over the ten years with special thanks going to guests Colin Gibson and Brian Suart. 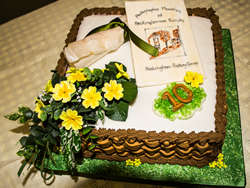 Their involvement in the restoration of the Beckingham Willow Works, enabled them to obtain funds for the creation of the Village History Group in 2006 and to secure a permanent base for the displaying and archiving of village history, relics and documents. 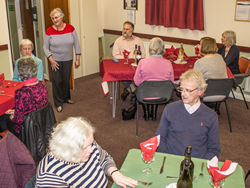 A delicious two course sit down meal was supplied by local caterer Jenny Hudson and served by her cheerful friendly staff. There were two choices for the main of a chicken dish or steak pie and three choices for the dessert with many having seconds of each course!! After which we then enjoyed a slice of the celebration cake specially made by Freda. The group had booked a speaker who sadly at the last minute was unable to attend due to unforeseen circumstances. However, Chris and Christine du Feu bravely stepped in organising a quiz involving photos of various items taken from unusual angles which members had to identify. This involved a lot of thought creating much amusement and entertainment. The quiz was won by Vice Chair Tony Thomas. 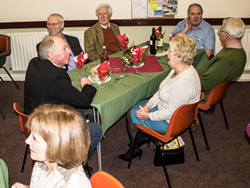 The whole evening was greatly enjoyed and appreciated by all attending.